This TV will bring entertainment to just about any room in your house. It boasts amazing picture quality, and great value in a nice, sophisticated design. 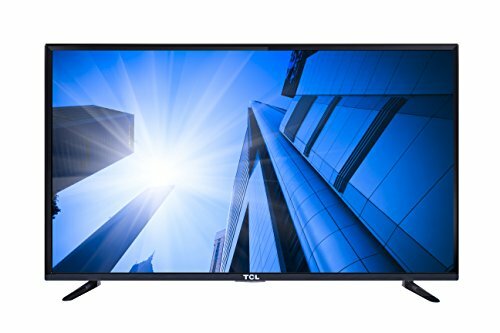 Full HD 1080p resolution of this flat screen LED HDTV delivers awesome contrast and color, whilst the direct LED backlighting brings luminous brightness and darker blacks, and still manages to maintain superior energy efficiency. You will surely enjoy watching your favorite movies on this TV thanks to its amazing picture as well as sound quality. Its Full High Definition resolution provides incredible picture quality, and the home theatre experience is completed with immersive sound by Dolby Digital processing. The stylish glass base and the slim frame look provide a premium look for the TCL 48FD2700. The USB port on the TV allows you connect some other USB device or a digital camera in order to show photos or play music, while the two HDMI ports enable you to connect some of your favorite devices. Anyone who wants the best for their home theater will probably be impressed with this screen. Its 1080p Full High Definition resolution delivers vibrant colors, amazing details, and crystal-clear picture. Enjoy in the great viewing experience the TCL 48FD2700 offers, and get the most from your 1080p devices, like your Blu-ray player with Full High Definition. Feature called TCL True Color ensures latest generation color processing as well as dimensional sorting. This is a great and advanced proprietary technology for color enhancing, and it expands your TV’s color spectrum thru manipulation of the video stream In order to boost color patterns and bring natural, true colors. This TV can be used in any room of your house, and not only that it provides an amazing viewing experience, but is also a sleek addition to your space. You can let it sit on its quad pedestal stand or, if you like, mount it on your wall like a piece of art. The screen is surrounded by the ultra-thin bezel which means the TV fits more screen into much less space. This provides you with that desirable, big picture experience without the need for sacrificing wall space or screen. Not only that its slim frame design allows you to maximize your entertainment space, but it also makes the process of wall-mounting it very easy. High-Definition Multimedia Interface – HDMI connections are standard for HD devices, and they combine both audio and video in one single cable in order to simplify set up. The best quality sound and picture are guaranteed, since the connection that is secure and all-digital limits signal loss transmission between the TV set and the source.